Second-game player Riley Knight leaves Adelaide Oval with the Showdown trophy in his grasp. My three-year-old saved his only meltdown of our epic sojourn to Greece – two taxi rides, two long-haul flights, two boat rides with a train commute and bus trip thrown in – until the moment we alighted into the stifling heat of Athens airport. We managed to drag him, along with our baby and a cluster of disproportionately heavy suitcases, into a waiting cab and, as we sped off towards Piraeus, I realised that the song playing on the driver’s radio was eerily familiar. While our trip from the rust bucket state to the biggest busted-arse economy in the world may have been booked a good year ago, it proved spectacularly ill-timed. For one thing, we landed slap-bang in the midst of a full-blown financial crisis, a meltdown to rival even a small child refusing to exit a Boeing jet until it takes him home for a bath. And, far more importantly, I was missing the Showdown. Which was, with all that’s happened, surely the greatest Showdown yet played. The Greeks may be accustomed to violent demonstrations of late, but I’m confident they hadn’t heard the sort of screams that emanated from our Hydra apartment in the early hours of Sunday as I paced the room listening to the match on the AFL’s live stream via a dodgy wi-fi signal. If last week against West Coast proved that fairy tales don’t always come true, yesterday suggested that every once in a while, they still can. 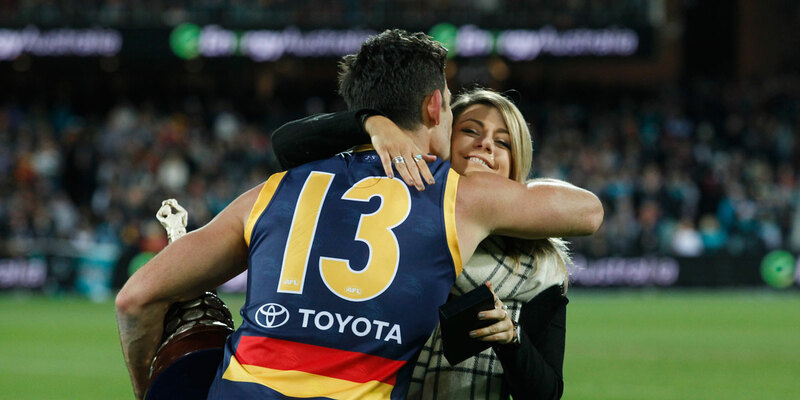 And indeed, there was a dreamlike quality to the whole thing, from the teams emerging through the shared banner in stoic solidarity for Phil Walsh to his daughter Quinn, in a feat of bravery bettering anything seen on the field, tearfully delivering the medal bearing her father’s name to the deserving Scott Thompson. And in between, a manic contest that delivered the ultimate tribute; fashioning the masterpiece Walsh set out to create. It is condescending to say merely that the Crows did well given all they’d been through. I’ve always taken issue with those who say they go for both South Australian teams. That’s like saying you want both the Empire and the Rebels to win in Star Wars – pick a side, people! But here, at last, was a Showdown for all those vacillating types, a Showdown where both sides stood tall and South Australian football was the ultimate winner. And, at long last, a Showdown that ended like A New Hope, with the happy heroes getting medals, instead of The Empire Strikes Back, with the bad guys winning and the good guys all nursing long-term injuries. There were injuries, of course. Reigning club champion, All-Australian and cat enthusiast Daniel Talia was subbed off with concussion, freeing up Power spearhead Jay Schulz to impact the contest. Which merely made the Adelaide victory more remarkable, as Thompson, Sauce Jacobs and Patrick Dangerfield (another Cat enthusiast, reportedly) ran riot in the midfield tussle. Towards the end of the third term, the commentator on Triple M uttered those magic words: “Port Adelaide are woeful at the moment, and Adelaide are exceptional”, and all was right with the world again. But as is the way of the world, it didn’t stay right for long. Much as I hated that last quarter (and much as it confused my kids to see their Dad pacing the apartment with headphones on yelling and shaking his fist at the walls), it was the finish the game deserved. And probably the finish Port deserved (close, I mean; not losing. Though they deserved that too.) Had Paddy Ryder kicked straighter, he could have shucked an unspectacular season to claim the Phil Walsh Medal. He didn’t. Thank God. It shames me to say it, but this game was the highlight of my entire overseas trip thus far. And with so many things to play for, it seemed almost an afterthought to note that that razor-thin three-point margin propelled us back into the eight – and almost certainly ended Port’s season. Both of which are reasonably significant (and enjoyable) feats in of themselves. Can we get back to hating each other now? Enough, enough now. The ultimate tribute to Walsh will be to get on; to get the job done. That litany of soft 50s (both ways), unpaid marks in the goalsquare (their way) and errant jabs in the eye (our way) certainly helped to revive that familiar sense of disdain (both ways). Some observers worked themselves into a righteous lather at the denouement when an army of Power supporters greeted the final siren and the Crows’ victory with loud boos. What gives? I’m all for it. Isn’t this supposed to be a pace-setting rivalry that scales unique heights of spite? All this being nice to each other, it’s really not in the spirit of the game. This is not the kind of relationship we were supposed to have. And while the Adelaide Football Club will never fully move on from these past dreadful weeks, for now it is time to stop making every match into more than it is. Enough, enough now. The ultimate tribute to Walsh will be to get on; to get the job done. Fortunately next week provides the opportunity to do just that, against a side with whom we have no historic rivalry, and against whom we have nothing to prove but our worth. There is just the minor problem that Gold Coast happen to have the best player in the league running into season-best form; if Ablett’s 30 touches and three goals weren’t convincing enough on Saturday against GWS, his 17 tackles was more than double what any single Crows player achieved this week, and indeed more than a quarter of the entire team’s combined output. All of which could see me rack up a data roaming bill of Stephen Yarwood-esque proportions and, potentially, send me into screaming fits to rival any three-year-old’s. But that is as it should be; after all, the ultimate fairytale finish is still there to be realised. Can we make the finals from here, with the Pies, our likely challenger for eighth spot, emulating their injury-plagued 2014 fadeout and games against three likely finalists from our final seven starts? I haven’t a clue; it’s all Greek to me. But I can’t wait to find out. Touch of the Fumbles is InDaily’s Monday AFL column. For new readers, yes, it’s shamelessly biased – if you feel the need, even up the score in the comments below.